Even after being carefully washed or peeled, nearly 70 percent of fruit and vegetables sold in the U.S. contained pesticide residues, according to a review of recent tests conducted by the Department of Agriculture. “It is vitally important that everyone eats plenty of produce, but it is also wise to avoid dietary exposure to toxic pesticides, from conception through childhood,” said Sonya Lunder, senior analyst with nonprofit Environmental Working Group, which conducted the analysis. The reviewed data revealed a total of 230 pesticides and pesticide breakdown products in thousands of crops that were sampled. Among the report's key findings: more than one-third of strawberry samples analyzed in 2016 contained 10 or more pesticide residues. More than 98 percent of apples, cherries, nectarines, peaches, potatoes, and strawberries tested positive for at least one pesticide residue. Spinach had almost twice as much pesticide residue by weight compared to other crops. EWG publishes a separate annual shoppers guide based on the underlying review of USDA data. 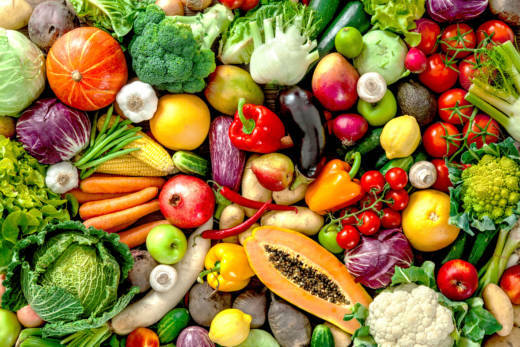 The guide consists of the "Dirty Dozen," a list of produce with high levels of pesticide residue, and the "Clean Fifteen," a list of produce with the least residue detected. Produce on the healthy list include avocados and sweet corn, which had less than one percent of pesticide residues. In this year's main report, more than 80 percent of the following fruits and vegetables had no sign of pesticide residues: pineapples, papayas, asparagus, onions and cabbage. Hot peppers was added this year to the dirty dozen list after researchers found that 739 samples of hot peppers contained residues of three "highly toxic" insecticides, including a neurotoxin called chlorpyrifos. Studies have found that pregnant women who are exposed to high levels of chlorpyrifos have children who display lower IQ scores and poorer mental development. In addition to hot peppers, researchers found chlorpyrifos residue in apples, nectarines, and peaches. Last year, the U.S. Environmental Protection Agency was slated to ban the use of chlorpyrifos in foods. But incoming EPA Administrator Scott Pruitt overturned the scheduled ban. The report notes that cooking the hot peppers typically diminishes any pesticide levels in the vegetable. The EWG report also cites two studies that link poor fertility with consuming high-residue produce. The studies, conducted by researchers at the Harvard T.H. Chan School of Public Health, looked at couples seeking treatment at a fertility clinic. Women who ate two or more servings per day of high-residue produce were 26 percent less likely to have a successful pregnancy, according to the 2018 study. Researchers looked at the diets of more than 340 women. "Going into the study, I was positive that we would find absolutely no relation between exposure to pesticide residues and adverse reproductive outcomes," senior author Dr. Jorge Chavarro, told CNN. "While I think we need more studies to confirm or refute our findings, I am now more willing to pay the extra money for organic apples and strawberries than I was when we started this project." A separate Harvard study in 2015 found that male participants who consumed high-residue produce showed poorer sperm quality. The men were tested over an 18-month period. "When you look at pesticide residue in food, it's consistent with a number of studies that look at diet as a source of exposure. When you switch to organic food, you find lower levels of exposure to pesticides," said Asa Bradman, the associate director at the Center for Environmental Research and Children's Health. However, he cautions against alarmism and says that the issue is more complicated. "If you look at government data, very few samples actually exceed the standards for exposure," said Bradman. "There is tension between the public health folks who want people to eat healthier, and those who want to encourage people to minimize pesticide exposure. But the American diet is really not optimal and I would never want to discourage anyone from eating more fruits and vegetables." Bradman said in California at least, the use of more toxic pesticides has been declining for a number of years. "I think there is some potential benefit to organic agriculture in terms of lower exposure rates and perhaps lower impact on the environment," he said. "In the general agriculture sector, there's already a movement towards a more environmentally friendly and safer food production."